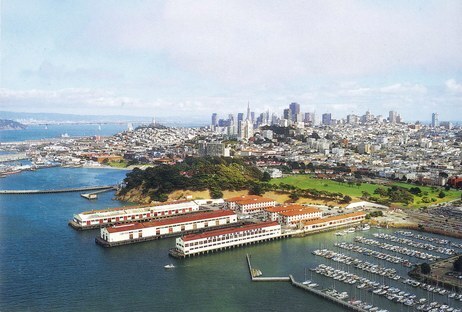 One of the ten recipients selected by the the Committee on the Environment (COTE) of the American Institute of Architects (AIA) for sustainable design excellence in the United States, the San Francisco Art Institute - Fort Mason Center Pier 2 by Leddy Maysum Stacey Architects is the transformation of an old U. 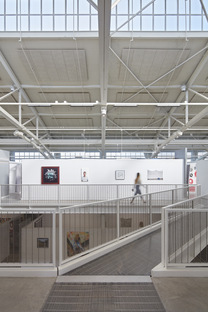 One of the ten recipients selected by the the Committee on the Environment (COTE) of the American Institute of Architects (AIA) for sustainable design excellence in the United States, the San Francisco Art Institute - Fort Mason Center Pier 2 by Leddy Maysum Stacey Architects is the transformation of an old U.S. army warehouse into a new university campus. San Francisco Art Institute (SFAI) is "dedicated to the intrinsic value of art and its vital role in shaping and enriching society and the individual". 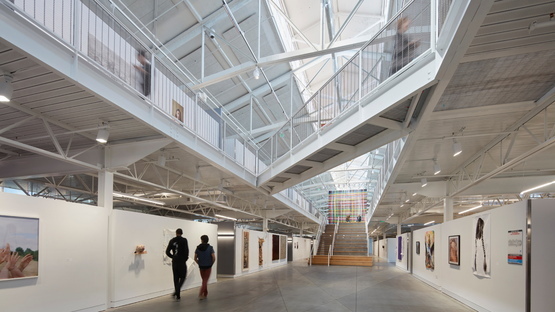 To support this mission, SFAI has created an arts campus at the heart of the vibrant Fort Mason Center for Arts & Culture (FMCAC), in an urban National Park. 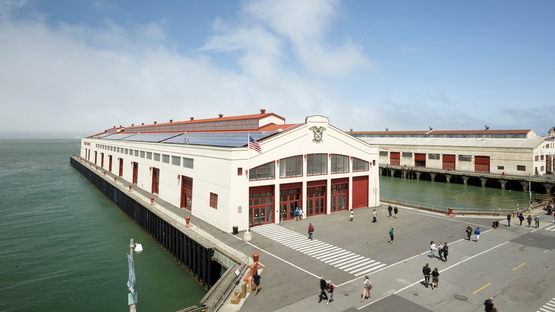 Here, at Pier 2, is the historic U.S. army warehouse, a 1909 concrete and steel structure. This is a very special part of San Francisco Bay, an ecosystem of great diversity supporting 500 species of fish, birds, mammals, amphibians and invertebrates, despite major alterations by human intervention like this military port created in 1882. 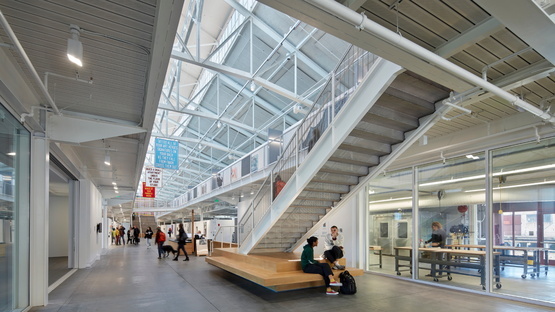 The transformation by Leddy Maysum Stacey Architects was made possible as part of a unique public-private partnership formed between SFAI, FMCAC, and the National Park Service (NPS) to create the new arts centre in the Golden Gate National Parks. 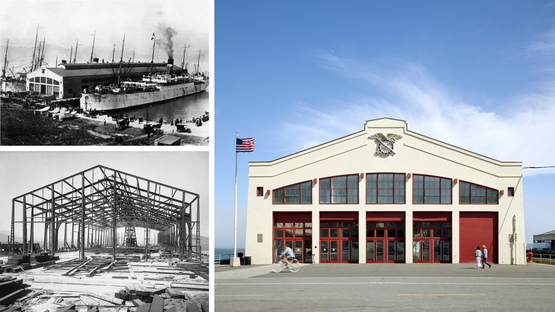 The adaptive rehabilitation of the pier shed preserves the industrial integrity of the landmark structure. The design team reused existing building resources to minimise its environmental and economic impact. 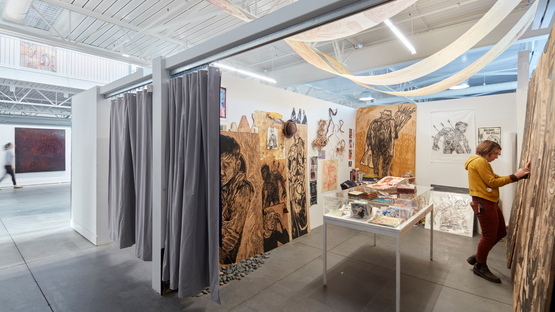 This supports the pedagogical and sustainable goals of the SFAI, creating a dynamic new hub for arts education as well as public education, giving the local community easy access to the water and positioning artists at the centre of public life. The design by Leddy Maysum Stacey Architects interweaves historic and contemporary, leveraging the dramatic light-filled industrial structure to create 160 studios, workshop media theatre, flexible teaching spaces and public exhibition galleries. The project team not only maximised the potential of the existing structure, they also integrated cost-effective sustainable systems, including a new high efficiency radiant slab. This, together with improved insulation of the building and natural ventilation, as well as San Francisco's mild climate assures excellent environmental performance. The rooftop photovoltaic solar system produces 100 percent of the required electricity and the design capitalises on the abundant interior daylight for the wellness of its users. The project convinced the members of the AIA COTE jury who praised the renovation as a perfect example of intelligent intervention to create something new for both the arts institute and the community while retaining the essential aspects of the original.